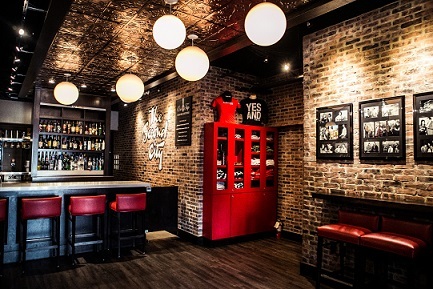 Since 1973, The Second City Toronto has been delighting audiences with innovative and timely sketch comedy that has consistently remained at the cutting-edge of the genre. For visitors looking for a night of hilarity, there is no better place. "People love sketch comedy," says producer Sophie Santerre. "People come to the show and two hours go by before they've realized it. It's a really engaging format--it's quick scenes with no lull and people want to see what's coming next." The Second City first opened its doors in Chicago in 1959, and today remains one of the most influential comedy programs in the world, regularly churning out some of the world's most celebrated comics. 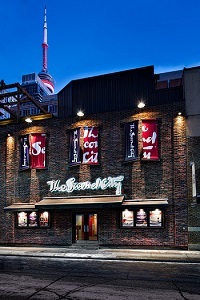 The Toronto Mainstage opened fourteen years later and has since become a staple of Toronto's entertainment scene. "We're not necessarily as well known as Chicago, but we're the only people here doing what we do," Santerre explains. "There are lots of other great comedy shows in Toronto, but none of them are self-producing sketch comedy every night like we are. It can get chaotic for us--that's a lot of shows--but it keeps us on our toes and keeps us from falling behind." As an improv show, every night is a little bit different at The Second City. "In some ways, there is no plan," Santerre explains. "We pick games and go off of audience suggestions. But when we have a premise for a show or a particular sketch, we have to try it out again and again. We play with different ideas and see what type of reaction we get from the audience. Sometimes, you start with one thing and it ends up as something completely different, but that end-product is still something fun that you can be proud of." There is, however, a method to the madness. "Comedy is an art form and we're always trying to figure out what else we can be doing. It's all about expressing different points of view," Santerre says. "Everyone has their own perspective, and there's always something in one of the shows that someone can connect to. In Toronto, we have a different audience, and in some ways, we can't be as risky as they can be in Chicago. But we take different chances. Second City's Guide to the Symphony, for example, is something really unique that can't be compared to anything else, where we combine sketch comedy and classical music. People sometimes come to check out the new comedy, and others are interested to see the world-class orchestras. It's a way for these two different artistic areas to reach out to each other. They aren't as separated as you'd think." It is this masterful blending of incisive commentary, smart humor, and goofy antics that have set The Second City at the forefront of the world of comedy. "I want the audience to leave with something to ponder," Santerre says. "Satire does something really fun and interesting--you can teach someone something without making them feel like you're lecturing them. You can show them different perspectives while making them laugh. It's great when someone leaves and says, 'I get that'. They had fun and learned something new along the way. But in the end, it's also about happiness. We try to stay fun, especially nowadays when people are angry all the time."